seisshikata ga wakaranai kara...boku wa kono sen no naka ni 'ireba anshin nanda. "I don't know how to interact with others, so I feel at ease when I'm in here." These are some quotes that I wanted to transcribe in Japanese along with the subtitles from FUNimation. 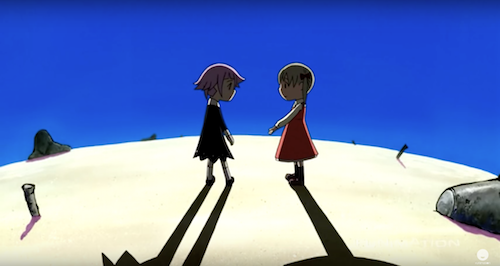 These are from Soul Eater, specifically episode 21 - May My Soul Reach You, toward the end of the episode. ima nara wakaru yo. kimi no hachyou. "Now I can understand it. Your wavelength." kimi wa seisshikata ga wakaranainjanai. dare mo kimi ni sesshite-konakatta dake. "It's not that you don't know how to interact with people. It's just that no one ever came to interact with you." dattara sa. 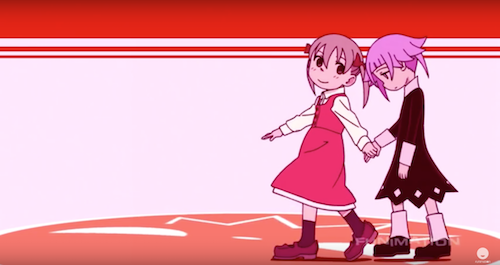 tomodachi ni natte kudasai. onegaishimasu. 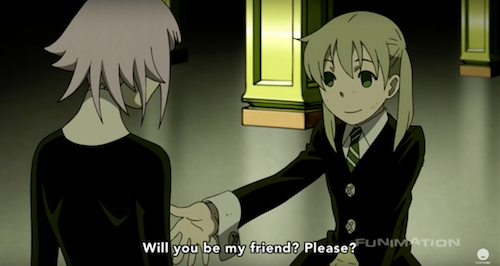 "So... Will you be my friend? Please?" dou sesshite ii ka wakkannai yo. "I don't know how to interact with others!" hito to sessusuru kyoufu ka? "The fear of interacting with people, huh..."
"Even I'm afraid of that..."
as though it were a bunch of gears. just a little while longer..."